First of all, apologies. This review is going to come across as more like a blurb than a review. Agreed, that’s a common error, but, even so, it’s an error I don’t normally like to make. 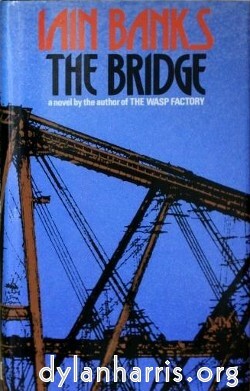 Iain Banks, may he RIP, is on record as saying that his 1986 novel The Bridge was his best book. He has a point: it is very good indeed. The best Iain Banks’ books reward rereadings with lots more detail and satisfying moments that bring more sense to the novel as a whole, and it was very obvious to me, even at one reading, that The Bridge is such a novel. It is a rewarding book after one reading, but I know full well I’ll come back to it in a couple of years time, enjoy reading it again, and get a lot more out of it. A man lies in a coma. He has created some narratives in his mind, which he explores while he lies unconscious and unmoving in hospital. These narratives have a strong dream quality, and have the logic and behaviour of dreams, so not only is the narrator unreliable, so is the world through which he moves. The first narrative is the narrative of the id, the invincible swordsman. This is a rather fun pastiche of a good number of rather bad sword and sorcery books, except that it’s well written. The swordsman slashes his way through a wide selection of myths, including, to my great amusement, forcing a change of management in Hell from Cerebus to Dante. Banks revisited some of this territory in his later Culture novel, Surface Detail. There’s more resonance than you might expect between the two novels, since the imaginary super–swordsman in the Bridge, a mainstream novel, is ably assisted by the accoutrements of a Culture agent, including a drone(–a–like), a ship, and a knife missile. I’ll say more about that below. The second narrative, the main narrative of the book, follows a man who’s lost his memory, who finds himself washed ashore at the foot of The Bridge. I don’t think it gives anything away at all to say the bridge of The Bridge is a super Forth Rail Bridge, hallucinated to a world spanning length by the man in the coma. It has become so long it covers half the world, temperate zone and tropics. Again, there’s a Culture feel about this world–spanning architecture, and, again, there’s a synergy with a later Culture book, this time Banks’ very last Culture book, the Hydrogen Sonata, which has the world encircling Girdle City, whose description sounded to me like a huge iron structure. The bridge of The Bridge carries a city, just as old London Bridge carried a village. The washed up man is taken in and given psychoanalytical help. He dreams of things which he reports, forgets, then encounters in later for real in his delusional life. His rich adventures suffer from the logic and flight of dreams. It’s all utterly delicious, full of symbology and psychoanalysis, a great narrative of a struggle to regain memory, and a great puzzle to explore. Later in the narrative the nameless man escapes the bridge by mischance, only to encounter war and desolation. The third narrative is the real world, the back story of the man in the coma. This is a love story, and it is this story that brings the book together. The nameless man has a name, and a love, and it’s all rather complicated. It’s real people making real situations messy. Now, I am a fan of Iain Banks’ Culture novels, all of which were published after The Bridge. The Bridge has a lot of elements of the Culture, from drones to bizarre world spanning architecture. But all these elements appear in the hallucinations of a man in a coma, they do not appear in the real world of the novel. You could argue that since the Bridge is set roughly a decade after The State of the Art (when the Culture visit the Earth), that perhaps the protagonist got to know the Culture, but, because of events in The State of the Art, his memories were wiped, but the wiping didn’t work so well (just like a key plot element of Banks’s final Culture novel, The Hydrogen Sonata). But I don’t think this works. For me, the Bridge is a standalone novel, not a Culture novel, by an author who went on to write all those brilliant Culture books. Still, the resonances between them make for interesting speculation. There is a great deal going on in this book, with a great deal of sophisticated undercurrent that I haven’t properly grasped after one read through. This is a classic Banks problem: his best books demand to be reread again and again, and each rereading gives a new reward. The Bridge is such a book.